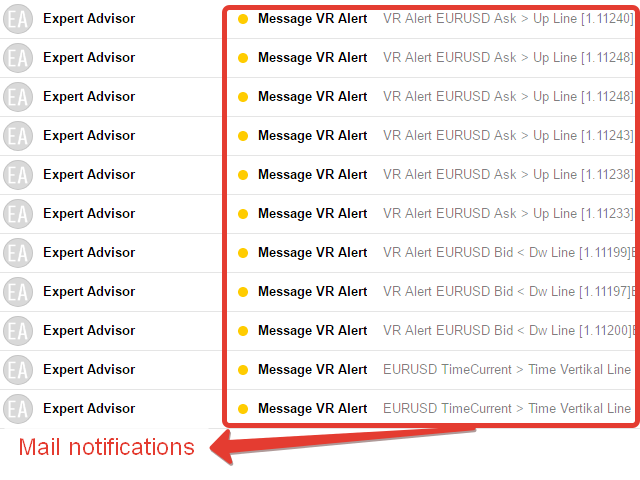 The VR Alert indicator warns the trader about the price reaching a specified level. The indicator has been developed as an assistant when you wait for a breakout of an important price level, which can take hours or even days. With this indicator, you do not need to constantly monitor your terminal. The indicator alerts of a level breakdown or of the specified time using the selected method. Monitoring charts for a prolonged time causes most traders to have "Blurred eyes". This makes them miss really good signals while looking at their trading strategies, and, conversely, see their signals where there is nothing to see. Drag the indicator from the Market folder in the Navigator window to the chart. Set your indicators according to your trading system. To place a level for a breakout, press the button labeled Up; breakdown - Dw; level by time - the Ti button. Type Line - line type, Horizontal Line - solid horizontal lines, Trend Line - trend lines. Standard alert + message box - enable the standard terminal alerts (displays the instrument, period and text). X-axis position - position of the indicator buttons along the X axis. Y-axis position - position of the indicator buttons along the Y axis. Color skins template - color scheme - skin. Manual skin Background button - button background color. Manual skin Border button - border color. Manual skin Text button - button text color. Manual skin Color line Up - breakout line color. Manual skin Color line Dw - breakdown line color. Manual skin Color line Ti - breakout by time line color. Manual skin Color alert background chart - chart color when warning about a level breakout. Corner label - anchoring corner for the program button. Position X Button - offset of the indicator name along the Х axis. Position Y Button - offset of the indicator name along the Y axis. 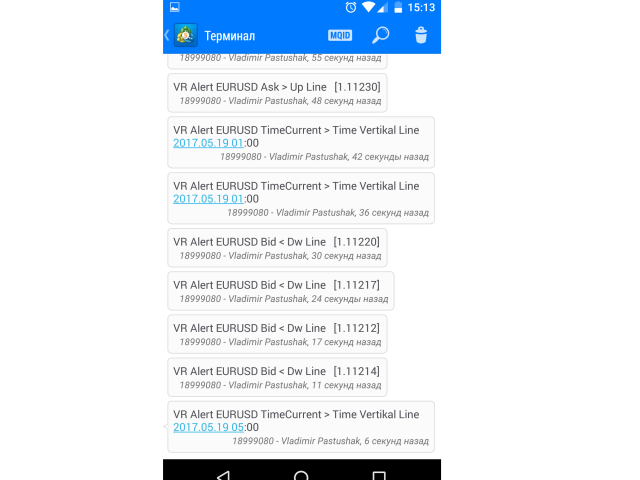 Use the MetaTrader 5 terminal and the VR Alert MT5 version. You will be able to monitor not only the price, but also any other indicators. Полезный индикатор, звук не перепутаешь со стандартными сигналами терминала, мигание на графике позволяет быстро идентифицировать событие если отслеживаешь несколько инструментов. 1. Кнопки индикатора перекрываются кнопками торговли в один клик. В настройки вынесены координаты кнопок, но изменение координат не работает. 2. Индикатор не реагирует на пересечение луча трендовой, временной диапазон его работы ограничен двумя координатами трендовой. Из-за этого "удобства" график нужно сильно сжимать по высоте, чтобы тянуть вторую координату трендовой как можно дальше и без гарантии, что этого диапазона хватит. Стремно, неточно и неудобно. Не рекомендую. Очень полезная штука, большое спасибо! 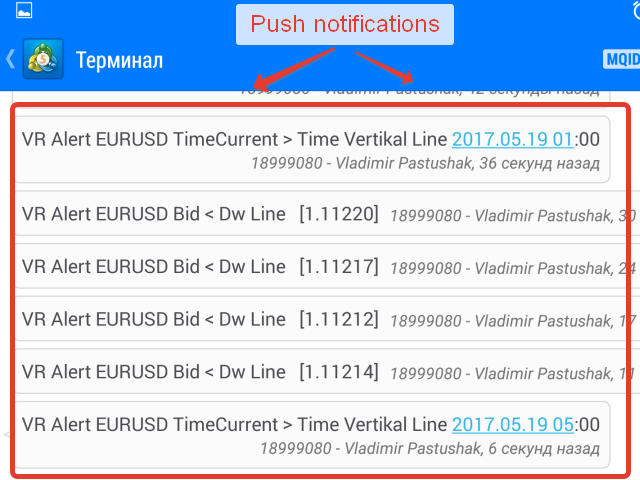 The "Standard alert + message box" parameter enables the standard terminal alerts (displays the instrument, period and text). The "X-axis position" parameter sets the position of the indicator buttons along the X axis. The "Y-axis position" parameter sets the position of the indicator buttons along the Y axis. Lines by angle have been replaced by trend lines, the lines preserve their price positions when changing the chart scale. Added skins - you can select a black or white color scheme, or customize the colors. Trend By Angle - Режим при котором линия всегда сохраняет свой угол относительно первой точки. При использовании режима Trend By Angle при изменении периода или масштаба графика линия сохраняет свой установленный угол. При такой работе второй конец линии всегда будет менять свою цену. При использовании второго режима трейдер не будет видеть угла линии, Линия всегда сохраняет свои координаты, не зависимо от масштаба или периода. Добавлена возможность продолжать луч в право (Ray Right = true) . Changed - the size of buttons has been reduced. Added - three buttons for turning lines on and off. Added - font size setting. Fixed behavior in case of change of settings. Now lines preserve their initial position. The indicator has been rewritten from scratch. Added a lot of new features.